Documentaries fulfill an important niche in filmmaking, combining the art of moviemaking with the task of showing the world as it is. I once attended a talk by Oscar winning producer Paul Wagner who won an Oscar for his documentary The Stone Cutters and was enthralled by his filmmaking experiences about having to frame shots in addition to conducting the interviews. While there have been some documentaries that really made a splash on the scene like Bowling for Columbine, the 2005 Best Documentary Feature race, The Times of Harvey Milk, any all of the animated Documentary shorts, the documentary has kind of gotten the shaft with the Oscars. Few people care about the Best Documentary Feature, and nobody cares about the Documentary Short. Why, awards for documentaries weren't awarded until 1941 when the Academy decided to honor some films that did well with war coverage. This was nine years after categories for short films were instituted, including Best Animated Short. The first Best Documentary category was a rather modest affair. Eleven documentaries were nominated, most of which were films about the war. The very first award went to Churchill's Island, an early NFB film about the Battle of Britain. Then the Academy went all out a year later, nominating a grand total of 25 films, many of which once again were about the war*. Most of the films were made by the governments of different countries, including Belgium, Britain, and the USA. There were two films that were very different from the others, for they were made by the Walt Disney Studios. *Including the NFB's Inside Fighting China, one of the earlier films to talk about China's struggles with Japan. It came out two years before Frank Capra's full length documentary The Battle of China. As I mentioned in the main review, Disney was more than happy to make propaganda films to increase support for the war. Disney in the early 1940s were going through a tough time, having lost several able animators during the Disney Strike of 1941: John Hubley and Bill Melendez, who would later become famous with UPA; Frank Tashlin and Maurice Noble, who would become cornerstones at Warner Bros.; and Kenneth Muse and Ray Patterson, who became among the main animators for the Tom and Jerry films that dominated the Oscars for most of the 1940s. Furthermore, their ambitious films Fantasia and Bambi were box office flops, the latter of which was due to the war going on in Europe. Yet they still had clout in the entertainment industry, and when the US government needed animation for their training and propaganda films, they turned to Disney. By 1942, more than 90% of the Disney animators were working on projects commissioned by the government. Most of these films were training films,* but there were a few films out there that were designed to reach the general audiences. Some included humorous war themed films like the legendary Der Fuehrer's Face or The Vanishing Private, but there were others that were meant to present a specific message to the American public. And it was these films that were honored by the Academy. *One of the most notable was a co-production with NFB on a film about the Boys Anti-Tank Rifle best known for its opening three minutes which is a humorous little short called Stop That Tank! that is very reminiscent of Tex Avery's Blitz Wolf. Corn is an important grain that played a major role in the development of both North and South America. It developed from early ancestor plants that grew alongside the Native Americans that lived in the land we now call the Americas. Early Indians discovered the plants in the harsh times, and the plant would become the cornerstone of the ancient civilizations: the Mayans, the Aztecs, and the Incas. From these civilizations the plant spread all across the world, where it accomplishes task that go well beyond that of being simple foods. It helps feed animals to make them rich and juicy, and play a role in many other industries, from hospitals to cooking to instruments of war. 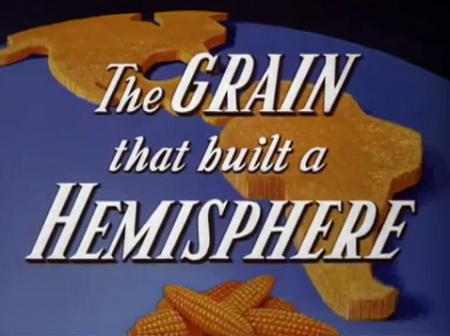 The Grain that Built a Hemisphere was a co-production with the Office of the Coordinator of Inter-American Affairs, which existed from 1940 to 1946. The office was meant to build up support within Latin America. Disney was sure familiar with Latin America. They had gone on a trip there in 1941, and turned their experiences into two of the strangest film they ever made, Saludos Amigos and The Three Caballeros. Before those films came Grain, which is a celebration of one of the most important imports from the Latin Americans, which is the Zea maize plant, better known as corn. Corn is one of the most highly cultivated grains in the world, with the US being the top worldwide producer. Only 1% of the corn produced is used for the food, the rest is used to feed livestock or to make corn ethanol, which is an important source of fuel either by itself or as an additive with gasoline. The importance of corn was well known even 70 years ago when the film was made. The film spends the first minute and a half talking about ancestors of corn and how they reproduced. From there it went on to describe how the Indians came across the plant, and how it became worshiped amongst the Mayans, Aztecs, and Incas. Then comes a minute-long explanation of the food uses of corn, but we all know that corn really isn't used for food. The film spends twice as much time talking about how farmers inbreed corn, which is basically a kinder of way of saying that the plant is reproducing with itself, but that's the way plants roll. Such processes can eventually lead to stronger strains, because hooray for Mendel. The final three minutes are used to talk about the livestock and industrial uses, which is still the primary use even today. And it is all thanks to the South American Indians that this amazing plant came to pass. Unfortunately the film couldn't have been more dry. It doesn't help that the uncredited narrator is quite monotonous, but he was probably just an animator or a writer that didn't have much acting abilities. Much of the film is expository, spending 1/3 of its running time talking about how corn reproduces. And as with all expository films there isn't much excitement with the animation. Many of them are still frames. Chuck Jones managed to make that work with So Much for So Little, interspersing the film with plenty of great designs and dynamic action sequences. Those really don't exist in Grain. There is a cute scene of two inbred corn plants getting together and producing their proud offspring, and the farm scene has some cute elements of slapstick involving a little piglet, but that's about it. Corn is an important crop in 1942 and even today, but this film doesn't really make us excited to learn about it, and I doubt that the Latin American countries that the Office of the Coordinator of Inter-American Affairs wanted to woo would be very impressed either. Donald Duck is a dancing in front of a mirror to a Jiminy Cricket tune playing on a radio. The song ends and a voice comes on and talks about how we are in a state of war and that the common man not fighting overseas has an important task to perform. Donald was livened up by the song and was eager to do whatever it takes, until he hears what the task is: to pay his income tax. That is, however, until the man on the radio explains that the income tax can be used to produce the weapons to beat the Axis. And it goes to show how that happens. For it is our new spirit and our tax dollars that will allow us to achieve victory in the war. So pay your taxes and become a patriotic American! War is an expensive industry, and with the American involvement in World War II beginning on December 8, 1941, they needed more funding to support the war efforts. So Congress passed the Revenue Act of 1942 which basically increased tax rates. Nobody likes paying more money, so to help drum up support for the law Secretary Treasurer Henry Morgenthau Jr. commissioned Disney to make a film that would highlight the importance of paying your taxes, and to do it on time. Disney got to work and had a film ready by the end of January of 1942 starring their biggest star at the time, Donald Duck. Morgenthau was aghast. Here was an important message to give to all the taxpayers, and they're delivering it with the help of a duck? He wanted a character thataudiences can identify with, a Mr. Average Taxpayer. Disney countered by saying that Donald was their biggest star, and if audiences can see that even a star among stars like Donald Duck has to pay their taxes, then the average taxpayer would be more likely to comply. Disney eventually got his way. 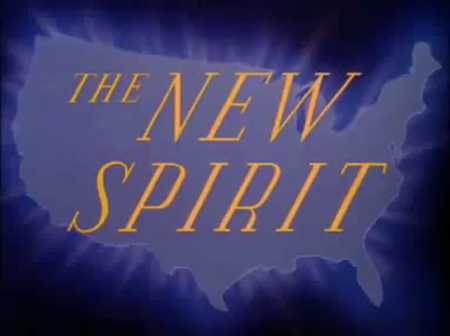 The film opens with a line of four Donalds dancing in a line to a song by Cliff Edwards (the voice of Jiminy Cricket) about the new Yankee Doodle Spirit in the heart of everyone. It turns out that he was dancing in front of one of those multi-angle mirrors. Then he proceeds to get into a conversation with voice actor Fred Shields (the narrator of how to films like How to Play Football) on the radio. After a long back and forth the Shields presents the important task of paying taxes, and explains how important it is. Donald is convinced and sets off to show how simple it is. He walks Donald through the form and once completed, Donald rushes to hand the check to the IRS in person and leaves the film. Shields then spends the last three minutes of the seven minute film to show off the weapons paid by your taxes that will come to beat the Axis. The New Spirit is about a very dry topic, that of taxes, and manages to make it quite interesting. The choice to have Donald Duck star was a good one as he manages to make things rather enjoyable with the familiar Donald Duck voice and mannerism. The catchphrase of "taxes to beat the Axis" is very catchy, and one that will play a major role in the sequel film The Spirit of '43. The section of actually paying the taxes could have been very dry, but with the help of an anthropomorphic pen, bottle of ink, and blotter the sequence is actually quite stimulating, even if the explanation wasn't very detailed. Of course, one of the most critical things to come out of this scene is the reveal that Huey, Dewey, and Louie were adopted, which they most certainly weren't in their original appearance in Donald's Nephews. It really lends credence to the scenario presented in a particularly powerful Robot Chicken episode, although considering they spelled Louie as "Louey" it's unsure how canon this film is. The last three minutes was spent just showing the weapons that will beat the Axis and how they will demolish the enemies, presented as horrifying looking weapons of war. For example Axis tanks are presented as a grotesque beast with turrets as eyes and mouth. But don't worry, the weapons paid for by your taxes will send those things back to the grave. And the film ends with a promise of victory. It's very intriguing film and makes you wonder why the Bush government didn't try to contract Disney for a New Spirit of 2002. Yeah...that's probably enough politics in one post. So those were two of the 25 nominees for the second ever Best Documentary award. The Academy chose four winners, and unfortunately none of them went to a Disney film. The winners instead went to The Battle of Midway, a Navy-commissioned film on the decisive battle by John Ford; Kokoda Front Line!, a documentary on the Australian war efforts; Moscow Strikes Back, about the battle raging in Russia, and Prelude to War, the first of Frank Capra's legendary "Why We Fight" series. At least Disney had his win for Der Fuehrer's Face to fall back on. A year later the documentary category was split to include both Documentary Features and Documentary Shorts. And the rest as you say is history. "The importance of corn was well known even 70 years ago when the film was made." Yeah it was interesting they make a mention of Ethanol in this film, which today is a accessible, if not pricey fuel source for automobiles. Of course had they known of corn's eventual use as a substitution for cane sugar in the later decades (High Fructose Corn Syrup), we'd probably not bother with so much subsidized farming of it. "Such processes can eventually lead to stronger strains, because hooray for Mendel." Never underestimate the power of Mendel's teachings! "There is a cute scene of two inbred corn plants getting together and producing their proud offspring, and the farm scene has some cute elements of slapstick involving a little piglet, but that's about it." The only thing that redeems it a little for me is the Aztec blood ritual, with the knife laying on a bloody podium! I'm not sure why I focus on that one part but I do. It's a good image against the silhouette of the sacrifice happening and it works effectively well. "Disney countered by saying that Donald was their biggest star, and if audiences can see that even a star among stars like Donald Duck has to pay their taxes, then the average taxpayer would be more likely to comply. Disney eventually got his way." Well it must've worked because they did another one of these films a year later with very much the same message though it's opening has Donald in a struggle between two halves of his conscience, the rest though was a repeat of the first film ("The Spirit of '43").